These boats have been reported to be this country's first mass-produced boat. While not a distinct American innovation, the "Whitehall" evolved and was refined from various predecessors, rather than being created by actual design. 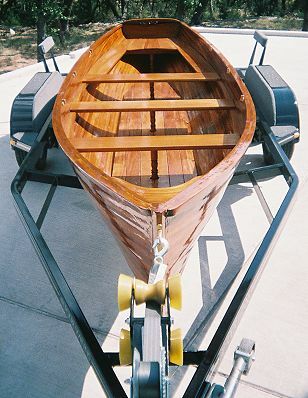 Noted for rowing easily and swiftly in both smooth and rough waters, they also have a reputation as safe, dry boats with ample load carrying ability. 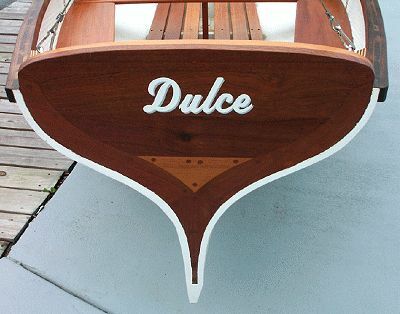 Having a shapely "wine glass" or heart shaped transom, the waterline form is actually a double ender with a dead-straight keel and pronounced forefoot that provides excellent directional control. 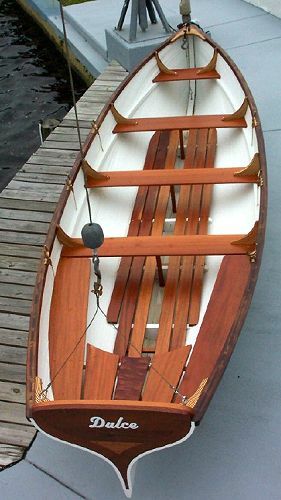 The original craft were built using wood lapstrake or carvel planking, best suited to skilled craftsmen. 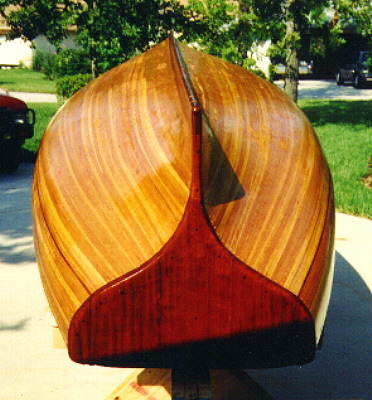 Our WHITEHALL-Wood version features a modern, yet proven, form of wood strip planking, edge glued and nailed together to form a strong stress skin hull. The Fiberglass version uses C-FLEX fiberglass planking and fiberglass laminate "one-off" construction. 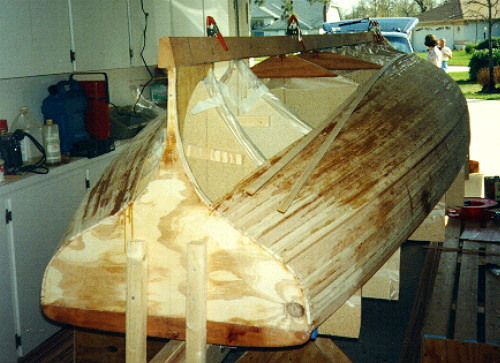 (See Boatbuilding Methods/Fiberglass for further information on this method.) 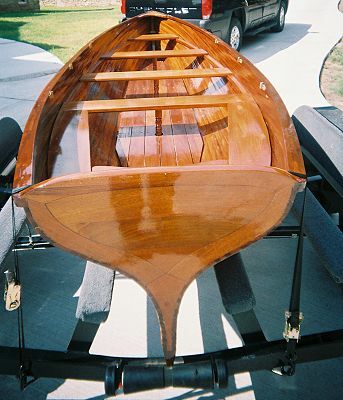 Whether building in wood or fiberglass, the boat exhibits ample natural wood members to capture the beauty, character, and romance of their forebearers. With our updated building methods, there are no permanent frames, no steam bending or caulking of seams, and no difficult "spiling" (fitting of planks). Full size patterns eliminate the task of lofting, even though a Table of Offsets is provided for those who want to perform this exercise. * Will vary with type of lumber used. 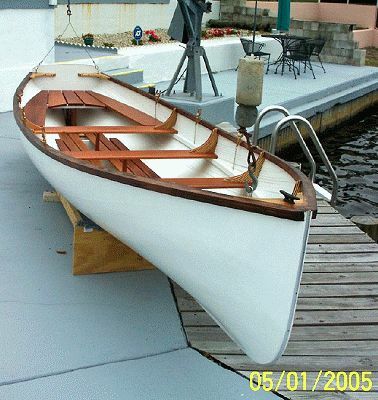 Hull type: Traditional round bilge Whitehall rowing hull for wood or fiberglass construction. WOOD version features glued and edge-nailed "bead and cove" strip planking (no plywood is used in this version). FIBERGLASS version features single skin "one-off" fiberglass planking (C-FLEX). Hull is built upside-down over temporary form members in both cases. 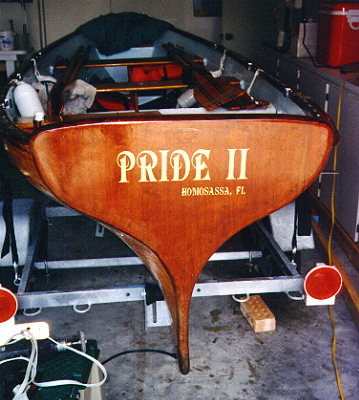 Power: Oars, 8' to 9' long, one to three oarsmen. 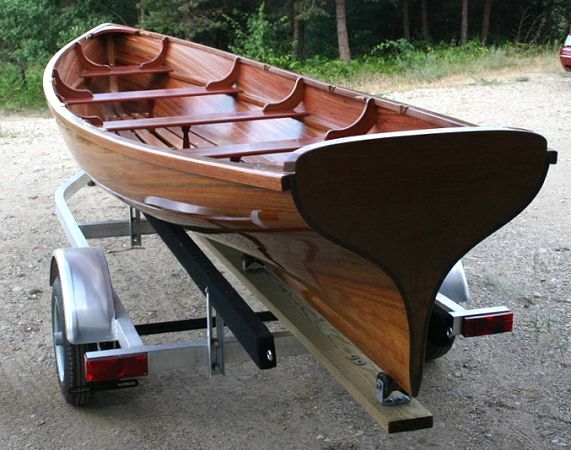 Trailer: Designed for use with Glen-L Series 1200/1800 boat trailer plans. COMPLETE PLANS include FULL SIZE PATTERNS for the station forms, keel bevels, transom, transom knee, stem form, and breasthook, plus complete plans, instructions, bill of materials, and table of offsets (though not needed if you use the patterns). Fiberglass Manual is included for fiberglass version. Weight for fiberglass and wood hulls will be similar. Weight study shows dry boat weight approximately 300 lbs. Figuring 150 lbs. per passenger, the boat alone will float at approx. 6" WL; with four passengers, approx. 9" WL. Hull: 300 lbs. = Load of 1362 ÷ 150 = 9 passengers. Thus it would be prudent to limit load to 8 passengers max. or a max. displacement of 1500 lbs. (somewhat below 12" WL). Therefore, list average passengers as 2 to 6. Displacement @ 6" WL = 392 lbs. Displacement @ 9" WL = 945 lbs. Displacement @ 12" WL = 1662 lbs.